=>> Control and monitor driver customer communication to ensure good customer experience. =>> Regular and consistent feedback activities / mechanisms to ascertain the service levels of 3rd Party Logistics providers and encourage improvements. =>> Reiterate on Values of Jumia/ Kaymu at all levels. =>> Should have the ability to work within set timelines in a constantly innovative workplace. =>> Can work with little supervision. =>> Good understanding of the English language, both written and verbal. =>> Candidate should be a team player and demonstrate positive thinking, a good work ethic and company loyalty. =>> Candidates should be familiar with use of MS Word, MS Excel and MS Outlook. =>> A good first degree from a recognized Institution. 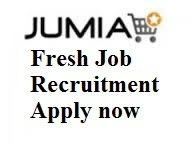 =>> 2-3 years’ experience in the area of Logistics / Customer Service / Account Management. =>> Applicant must be process oriented and analytical, must have experience in fleet training and must have handled teams. =>> Experience in Supply Chain Management in online or offline retail formats / FMCG companies is a plus.